"Four score and seven years ago our fathers brought on this continent a new nation, conceived by liberty, and dedicated to the proposition that all men are created equal." Metaphorically speaking, Elizabeth "Bessie" Coleman is my Abraham Lincoln. 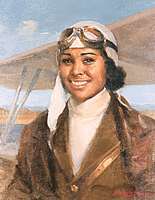 She is my hero because she is the first African-American woman to receive an aviator's license. She later performed aviation stunts for audiences that had people screaming at the top of their lungs and on their feet constantly! Their eyes were glued to her! She just had natural charisma. When you think about it, Bessie Coleman and Abraham Lincoln were incredibly synonymous. One example is their titles. Bessie had to work extremely hard for her license. She had to raise money for college, take classes, and learn how to fly an airplane! When she graduated, she was the only woman in her class, and she was the only African-American. Abraham Lincoln had to dive into his studies, support his family, and worked vigorously to become president. Even though it was a journey filled with twists and turns for the both of them, they have become amazing heroes of today. Bessie Coleman has been a great inspiration in my life. She worked extraordinarily hard to get where she did. She earned the respect from other citizens by doing what she loved. Bessie had great bravery and ingenuity to perform such intense and dangerous stunts. She hasn't only impacted my life but the lives of others as well. Both Bessie Coleman and Abraham Lincoln are outstanding heroes to look up to. They had the strength and the drive to achieve something they loved. They have also shown others no matter how old you are, what color skin you have, or what your gender is; you should do what you love. They have given people the confidence to follow their dreams. I think everyone should follow in those footsteps. Who knows? Maybe, if you follow the same traits as Bessie Coleman and Abraham Lincoln, you may become someone's hero.